Last week all I wanted to eat for dinner was some good homemade pizza. But with mine and my husband’s work and school schedule, making pizza was just not going to happen. 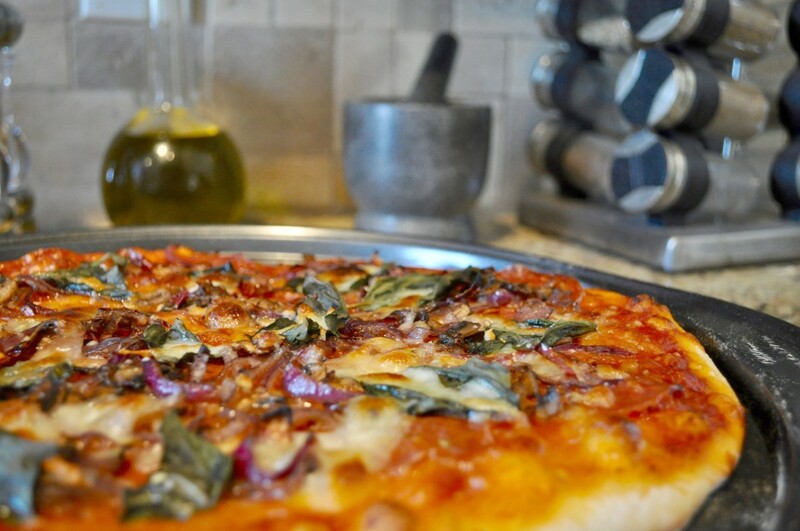 So when the weekend came we spent our lazy Saturday sipping wine and making pizza together. It wasn’t too difficult to make, and it wasn’t super gourmet, but it was sharing that time cooking together that I appreciate. Sauté the red onions, and mushrooms until they are caramelized, then set aside. Roll out the pizza dough and place on pizza stone. Set oven to 400 degrees Fahrenheit (adjust to how crispy or doughy you prefer your pizza dough). Cover pizza dough with marinara sauce and mozzarella. Put on the pepperoni, followed by the sautéed vegetables, and fresh basil. Put the pizza in the oven for 10 minutes (again, adjust to how you like your pizza cooked). 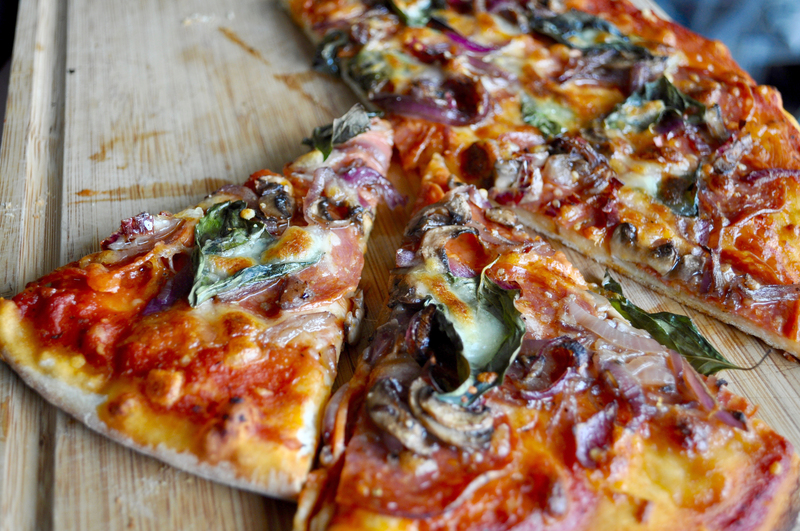 7 Comments on "Homemade Pizza"
Um, your pizza looks goooooood! I need to make a gluten free version of this ASAP! Yum/now I’m hungry! Thanks! It tasted as good as it looked! 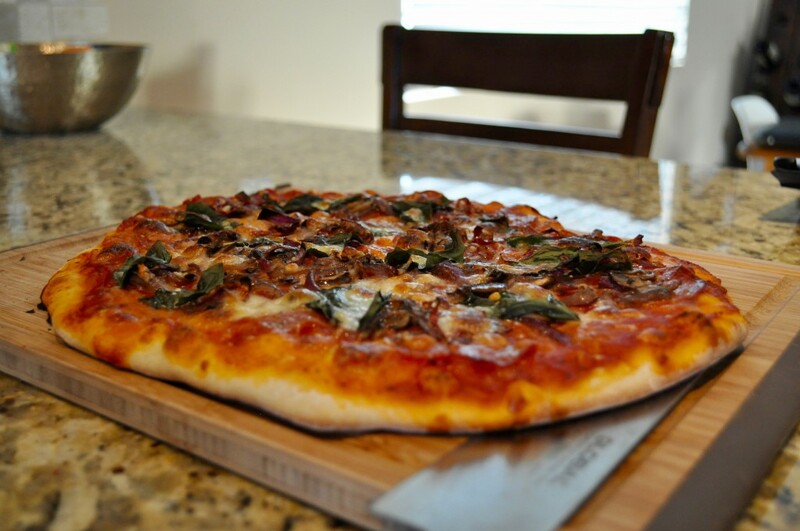 I love making homemade pizza! It is a Friday tradition for my husband and I! That’s a great tradition to have!